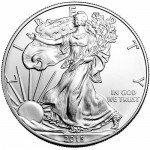 Available as low as $9.99 per coin over spot! As the smallest gold bullion coin produced by the Mexican Mint, the 2 Peso Gold Mexican Coin is rare and unique in a number of ways. 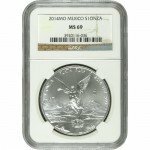 As part of the series of coins that commonly includes imagery from Mexico’s battle for independence from Spain, the coin shares common themes with others in the series. However, its smaller size and singularly unique reverse design helps it stand out. 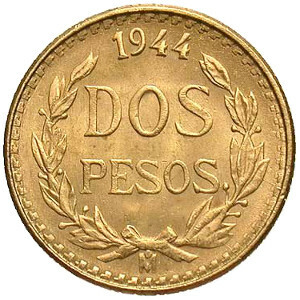 Now you can own one of these 2 Peso Gold Mexican coins from Silver.com in varied years and conditions. 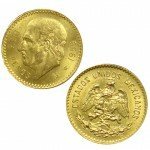 The Banco de Mexico began producing peso gold coins in various denominations in the early 20th century. This practice continued through the 1970s, before coming to a conclusion. The 2 Peso Gold Mexican Coin shares the Mexican coat of arms design that is featured on the 50, 10, 5, and 2.5 peso coins, while having a unique design on the opposite side that includes no major imagery from the War of Independence. On the obverse side of the 2 Peso Gold Mexican coin is the standard image of the Mexican coat of arms. In the image, an eagle is featured atop a cactus with a serpent in its beak. The eagle is forward facing on the coin, similar to all other coins in the series except the 20 peso coin, which featured a modern image with a sideways eagle. The forward-facing eagle is considered a traditional French design style dating back to the late 1800s. Invading Spanish forces established the Mexican Mint in 1535, making it not only the oldest in the Americas, but one of the oldest in the world. Today, the Mexican Mint produces currency for the Mexican government and the Bank of Mexico. 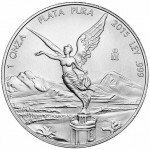 If you have any questions about the 2 Peso Gold Mexican Coin, other Silver.com products, or our purchasing process, please do not hesitate to contact our associates at 888-989-7223. Silver.com professionals are also available through our live web chat feature and email.